The first glimpse of your wedding needs to convey the ambience of your most special day in itself. A personalised set of invitations and assorted stationery will help you set the tone of your wedding while standing out from the rest. 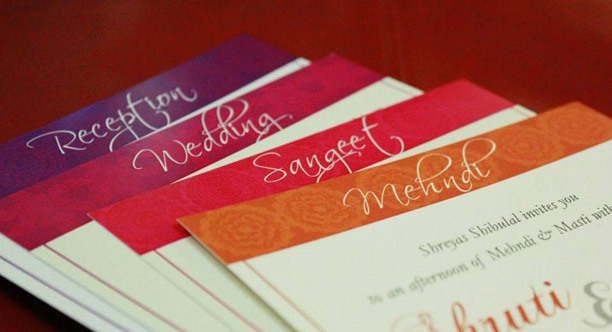 Whilst wedding invitations are undoubtedly the most important item of wedding stationery, there are many other items that you're likely to need to ensure that your big day is as special as it can be, and we at 3Productions will guide you in the right direction to think out of the box when it comes to invitations and special messages. Thank-you notes as well as Save the Date invitations are our specialities. These invitations not only warrant a different approach to announce your day but are likely to make a statement that will be remembered for years to come. With a keen eye on the detail and design, we make certain that every detail enhances the atmosphere of your wedding. In case you have something else in mind, we will be more than willing to see it executed.